BMW must be panicked staring into the face of the 2014 Mercedes-Benz E-Class that looks well, different, than its predecessor. In the battle of German luxury car facelifts, though, the 2014 BMW 5-Series must be one of the most subtle. Seriously, I'm looking for the new. There's new in the form of the 535d sedan, the long-awaited arrival of a diesel-powered 5-series in the US, bringing a 3.0-liter turbodiesel inline-six and 255 horsepower. It's also going to be a torquey son-of-a-gun with 413 lb.-ft. It'll also be available with added Drive in the form of xDrive all-wheel drive for those of you who are into that sort of thing. 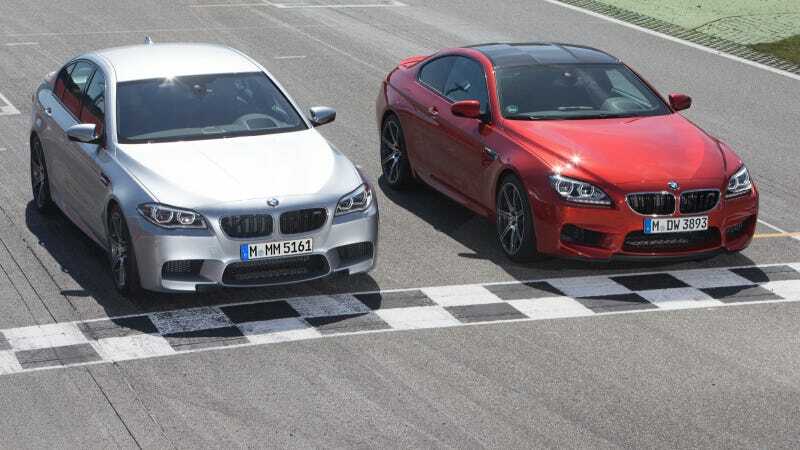 The M5 (and naturally, the closely related M6 convertible, two-door coupe and four-door coupe) have also been given a touch-up, and there's a touch more performance with the new Competition Package option. The pack includes an extra 15 horses for the 4.4-liter turbo V8 (bringing it up to 575, in case you lost count). The ride is 10 mm lower on the M5, according to BMW, thanks to suspension tweaks. Yes, a six-speed manual is available in case you don't dream of an M5 with a self-shifter. At the back, things stay even closer to the original. From the release, BMW says its latest creation sports "accentuated width of the rear end is underlined by an extra crease in the apron", all of which seems to translate into an new line. Oh, but there's a new optional trunk release operated by the wave of your foot. That's new, for the 5. Except for Xenon lights as standard on all models. And two additional pieces of chrome around the navigation screen. OK, now that's really it. And the 5-series GT? Yeah, they still make it. However, BMW found a way to add an additional 2.1 cubic-feet of cargo space to it! Still no 5 Touring for us, but at least they provided pictures of what we're missing.